Each of our products (including our flooring, ceilings, walls, dehumidifier, and more) each install with a manufacturer's warranty for quality, as well as our own in-house warranty. Your warranties will be transferable to the next owner of the home, and cover a time period measured in decades, not years. At Total Basement Finishing, we specialize in making the most of your home's basement by upgrading that bare, unfinished space into a beautiful new living area. Our experts operate throughout the Illinois area, including Naperville, Aurora, Joliet, Des Plaines, Elgin, Schaumburg, Arlington Heights, Bartlett, Palatine, Cicero, Kenilworth, Glencoe, Eola, Winnetka, Hoffman Estates, Barrington, and many surrounding areas. As members of the Total Basement Finishing international network, we are members of a cooperative network of professional remodelers who operate throughout the United States and Canada. 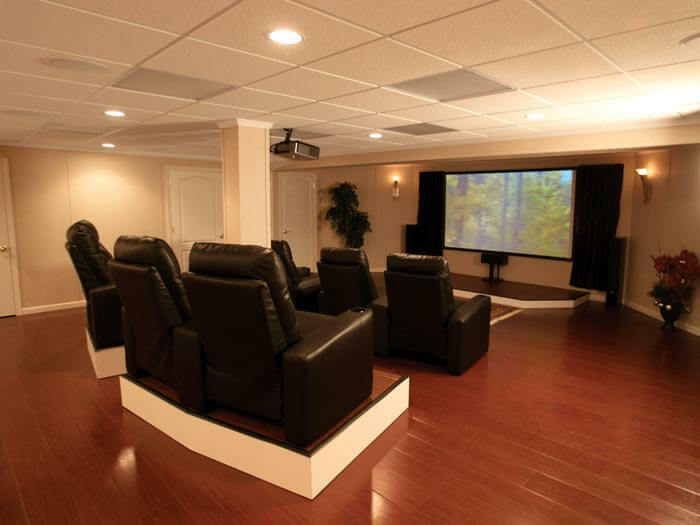 As such, we are privileged with exclusive access to Total Basement Finishing's complete selection of patented, award-winning remodeling products -- including the Basement To Beautiful™ Wall Panels, ThermalDry® Flooring, and our SaniDry™ Dehumidifiers. 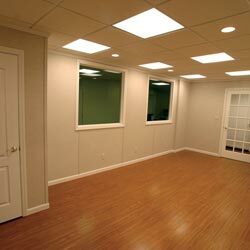 Sign Up For A Free Basement Finishing Quote! 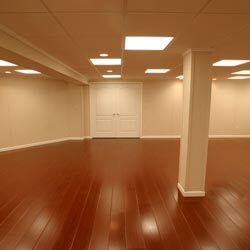 Contact Total Basement Finishing today, and we'll schedule an appointment to meet with one of our basement finishing experts at a time that's convenient for you. Our experts can visit with you to measure your basement, create a finishing plan that fits your vision, and work out the challenges your basement presents (such as the locations of the utilities, staircase, and windows). Before we leave, we'll create a written cost quote that the two of you design together using our unique, 3-D software. If you could add a floor of new living space to your home, what would you do with it? At Total Basement Finishing, the answer to that question has been as numerous as the homeowners we've worked with. Experts within our network have installed it all -- including spare bedrooms, children's play areas, home theatres, basement bars, personal gyms, and even a rock-climbing wall! 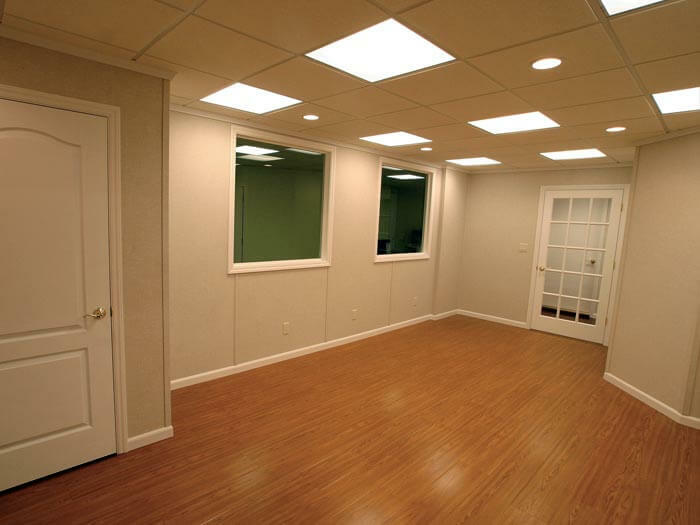 Our basement finishing system is versatile, and can be customized to fit any layout or design concept you have in mind. If you can imagine it, out experts will design it for you! We have a wide variety of flooring options, including three faux wood designs, two tiled designs, two carpeting options, our parquet flooring, and a warm, dry sub floor system for homeowners interested in installing custom carpeting. 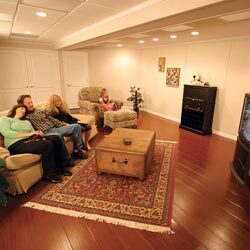 Our sturdy, studless basement walls are able to hold up weight with ease, and can support shelves, artwork, and even the weight of a flat-screen television with ease. Basement finishing is an excellent choice for homeowners who do not want to move, but would like to add additional living space to their home. A basement can be finished at about half the cost of building an addition on to the home -- and with no loss of yard space. This is largely due to the fact that your basement already has much of what's needed in place, including walls, utilities, and a place in your housing envelope. When compared to building an addition, it's also a much less invasive choice for residents of the home. Basement finishing includes insulating your basement walls, installing energy efficient lighting, and possibly even replacing old, inefficient basement windows with ones with modern, energy-saving ones. As your basement becomes insulated, it will become less drafty, more evenly conditioned, and much more comfortable for all who use the space. Maintaining your finished basement as warm, dry, usable space will also keep mold and musty odors to a minimum, which can improve how healthy your indoor air quality is and creates a safer living environment for children and the elderly. Our SaniDry™ dehumidifier systems are ENERGY STAR® Rated, and just what you need to make this a reality! Many materials that are effective for the rest of the home are not appropriate when finishing a basement. This includes materials that can be damaged by water and moisture, including drywall, wood, organic carpeting, chipboard, cellulose insulation, unencapsulated fiberglass insulation, and other materials that can support mold growth and/or be ruined my moisture. Each of the products in the Total Basement Finishing system are designed specifically for a long, beautiful life in the basement. Our products include written warranties for durability and quality, as well as resistance to mold, moisture, and water. We Can Transform Your Basement Into A Beautiful New Living Space! 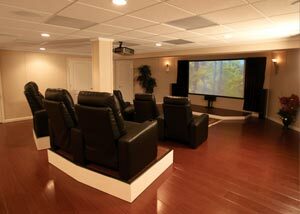 Basement finishing is our business, and it's what our remodeling experts work on every day. 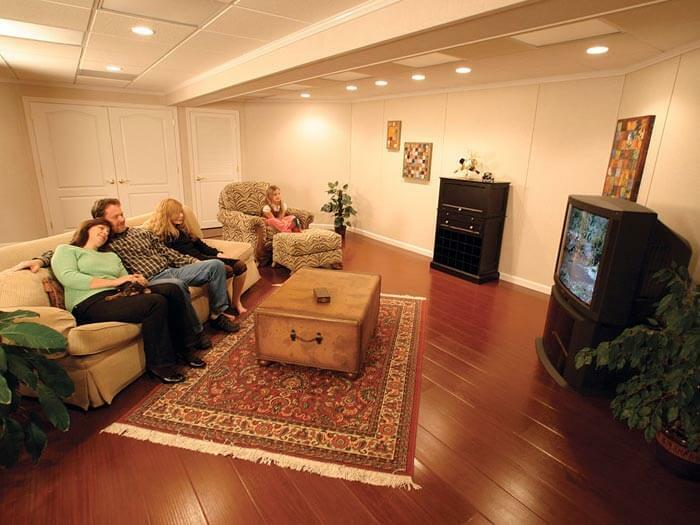 We can make your finished basement a reality -- usually in less than ten business days. Our installers are talented, experienced, and flexible, and will be able to work with you as your ideas evolve. There's no charge to meet with one of our experts for an on-site consultation and cost quote! 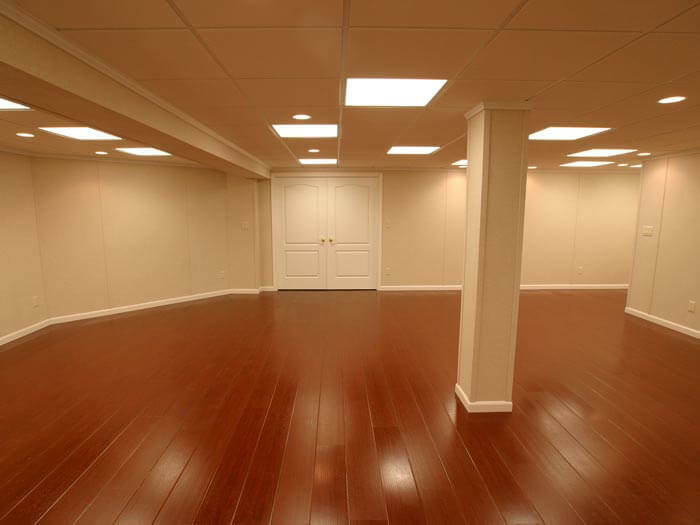 To schedule a basement finishing quote, contact us by phone or e-mail today! We proudly serve the Illinois area, including Joliet, Naperville, Aurora, Schaumburg, Elgin, Des Plaines, Cicero, Arlington Heights, Bartlett, Palatine, Kenilworth, Glencoe, Eola, Winnetka, Hoffman Estates, Barrington, and many surrounding areas.